Finding great value products on the highstreet is unquestionably satisfying. 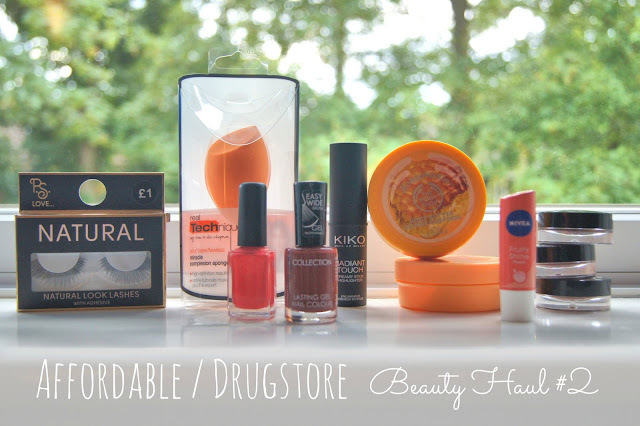 With my second bout of beauty bargains (check out my first haul here!) to show you, get your mitts on some great products at prices that won't break the bank. These creamy, slick pots of joy give lasting colour and beautiful shimmer. This formulation is my fave for eye makeup, a quick swipe and blend with fingers for an effortless look; Prune Nocturne is to die for. A great alternative for? Chanel's Illusion D'Ombres. For £1, who can go wrong? There's frankly not much more that needs to be said. If I had to critique, the band is not as supple as I'd like. A great alternative for? Eylure's 116's. Honey and Mango. Dreamy and creamy. I picked these up BOGOHP to use as hand creams as my hands get just so damn dry for no substantiated reason. A body classic, I'm sure you know these feel delish, if not, make sure you get to a Body Shop asap to try! As much as I adore my No7 highlighter, I loathe the packaging. This Kiko number is the same delectable, subtle champagne dewiness in a much more friendly twist-up tube; so fab for travel/on-the-go highlighting! A great alternative for? Benefit's Watt's Up. This balm is frankly dirt-cheap and gives the most gorgeous, sheer shine to the lips whilst smelling of peach (which lord knows I cannot resist, for my sins). Great for when your lips need something. A great alternative for? My favourite lippie ever. Another product that's old news but having nabbed both friends' Beauty Blenders and RT sponges, I actually prefer this! The flat plane is a really nice addition and gives you a crisp edge for getting in around the nose/eyes. A great alternative for? The Beauty Blender. Kiko Polish in 488 and Collection's in Daredevil. 488 is this gorgeous, vibrant coral/pink shot through with a lot of gold glitter. It's pretty bright on the nails and is the perfect colour for summer, the glitter glinting away in the sun. A great alternative for? The sorely missed Chanel Morning Rose - different tone, same gold glitter. Daredevil is almost the polar opposite; an understated and moody, rusty, red-brown colour that makes me feel just terribly sophisticated and womanly. For more bargains, check out my other haul here! Love drugstore products that are high quality and at a reasonable price. Love how you mentioned what the products would be a great alternative for--I'm such a sucker for drugstore dupes and this is perfect! Love this haul, you've picked up some really great items (also TOTALLY love how you say what each thing is a great alternative for!) The Kiko highlighter looks absolutely gorgeous, might have to go and pick that up! I love my RT sponge - it's so great! So GREAT! Bisous from France! The Bourjois eyeshadows look amazing!! I really want to try the Real Techniques sponge too!